King, Betty Nygaard. "Walter Homburger". The Canadian Encyclopedia, 18 December 2013, Historica Canada. https://www.thecanadianencyclopedia.ca/en/article/walter-homburger-emc. Accessed 18 April 2019. Walter Homburger. Administrator, impresario, b Karlsruhe, Germany, 22 Jan 1924, naturalized Canadian ca 1942. He was born into a musical family but did not study music. He left Germany for England before World War II and in 1940 arrived in Canada, where he became interested in managing artists and presenting concerts. As head of International Artists Concert Agency, which he founded by bringing Lotte Lehmann to Toronto for a recital in 1947, he presented an annual series of concerts and recitals in Toronto featuring many of the world's outstanding singers and instrumentalists, including Louis Armstrong, Paul Badura-Skoda (his North American debut), Erna Berger, Victor Borge, Victoria De Los Angeles, Duke Ellington, Kathleen Ferrier, Emil Gilels, Vladimir Horowitz, David Oistrakh, Luciano Pavarotti, Itzhak Perlman, Andrés Segovia, Rudolf Serkin, Isaac Stern, Joan Sutherland, Van Cliburn, and Pinchas Zukerman. In addition, he presented such groups as I Musici, the Netherlands Chamber Orchestra, the Vienna Boys Choir, and many of the great symphony orchestras of Europe and the USA. In 1949 he promoted and managed Opera Backstage, Herman Geiger-Torel's first attempt at touring opera in Canada. He was the first manager of Donald Bell, Victor Braun, Glenn Gould, Louis Lortie, Jan Rubes, and 1951-5 of the National Ballet of Canada. He introduced the first North American artist (Gould) to the USSR in 1957. Homburger became managing director of the TSO in 1962, and in this capacity was one of Canada's leading arts administrators, guiding the orchestra's affairs with a decisive blend of shrewdness and caution which attracted criticism from the musical avant-garde but kept growth constant and attendance strong through years of great economic challenge. Concurrently, he was consultant in 1964 for the Centennial Festival of the Arts Survey. 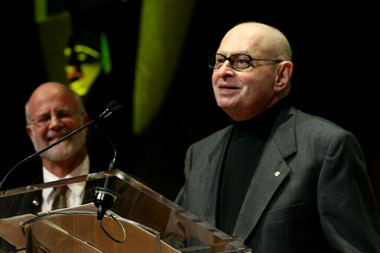 In 1974, on his 50th birthday, a group of friends established the Walter Homburger Scholarship, available each year to a first-year performance student at the University of Toronto. In 1978, he managed the orchestra's tour of China - the first visit there of any Canadian orchestra..
Homburger turned over the management of his International Artists series to the Toronto Symphony in 1982, but remained a consultant. His retirement as the orchestra's managing director was the occasion of a special concert in his honour in Roy Thomson Hall 9 Mar 1987. This 'Great Gathering' of international musical performers was broadcast on CBC radio and TV and netted over $2.3 million for the Toronto Symphony Foundation. Homburger continued to advise orchestras and musical organizations across Canada and the USA, and twice acted as a juror for the 1988 Min-On (Japan) International Conducting Competition in Tokyo. In 1993 he came out of retirement to manage the burgeoning career of violinist James Ehnes. He was the first Canadian to receive the Louis Sudler Award from the American Symphony Orchestra League, and was made a Member of the Order of Canada, both in 1984; the Association of Canadian Orchestras honoured him in 1986 with a special citation, and he received a Canadian Music Council medal in 1987. In 1997 the Toronto Symphony marked Homburger's 50th anniversary as a concert presenter with a special recital. In 1999 to mark his 75th birthday Ehnes and Yo Yo Ma performed a recital at Roy Thompson Hall. He was awarded the Queen's Jubilee Medal in 2002 and the Governor General's Performing Arts Award for Lifetime Artistic Achievement in 2010. Homburger has been called Canada's most famous impresario (Globe and Mail, 11 Jan 1997). His archives are held by the Library and Archives Canada.